Provide high quality products that combines performance with value pricing, while establishing a successful relationship with our business partners. Thus imbibing high standard of business ethics and organizational values. We are one of the leading brand of Agarbattis in India by providing quality that is Unmatched and functioning with unique process method. We at Nandini for more than 26 years, have been developing products that offer variety of fragrances which cater to different needs of different stratum of society.What started as an small entrepreneurial venture with a small team in 1989, has now grown to become one of the biggest house of Quality Agarbattis in India. Inception of Camphor and dhoop products has also achieved a greater share of business for us in last 6 years. We value for achieving customer satisfaction and striving customer delight to our business along with providing products of high quality. I have collected a packet of Nandini Agarbatti incense stick from a shop in Nashik. The fragrance is unusual. 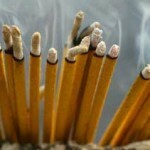 I would like to have a dozen packets of this incense stick.